MC4000, MIDI Control Surface for DJ from Denon DJ. Denon DJ also introduces at NAMM a new 2-channel MIDI controller for Serato DJ, the MC4000. 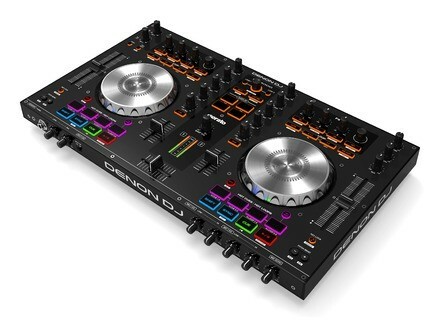 The Denon MC4000 control surface is designed for professional DJs who mix on a computer with Serato DJ (Intro version included), but also Traktor 2 and Virtual DJ 8. The new MC4000 will be available this year, for $399.99 MSRP. [NAMM] A vinyl interface for Serato Denon DJ had this brilliant idea with the DS1, a small tool for turntablist DJs that is introduced this weekend at NAMM 2015. [NAMM] 2 Numark Mixtrack mkIII controllers The Numark Mixtrack DJ MIDI controller is upgraded this year with a third generation of standard and Pro models. [NAMM] Rane MP2015 DJ console Rane introduces this week at NAMM 2015 a new mixing console for DJ that can handle analog and digital sources.